I cried rivers of tears after coming home from student teaching one day. I hated it and couldn’t bear to go back. I sobbed and sobbed and my mom sat and just listened wanting me to feel better and be happy. After college, with a double major in Environmental Studies & Spanish, I returned home and had no clue what I wanted to do with my life. I spent most of my extra time while in school either running or watching The Food Network and dreamed of culinary school, but that didn’t seem to be the most logical route. I had just spent four years in college and my parents spent a lot of money so I could get a “real job,” so I planned to look for a job in environmental work. Environmental jobs were few and far between in Cincinnati and I couldn’t imagine spending time in the field counting bees for the rest of my life. I worried it wouldn’t go anywhere and I wouldn’t end up making any money. So, I decided to become a Spanish teacher. It seemed like a safe next step and my mom encouraged me saying, “Being a teacher is a great job as a woman. When you have kids you will have the Summers off!” I know she was just trying to be supportive and not forcing me into anything. Well, I never became a Spanish teacher and I still don’t have kids. I did try to become a Spanish teacher and even went as far as having three student teaching experiences. The last student teaching experience was kind of a disaster. My mentor wasn’t very supportive and basically told me I should pursue something else. I guess he heard me talking about culinary school a little too much. I got booted. They literally dropped me from the program. My heart really wasn’t in it even though I tried to force myself to like it. It was time for me to pursue my real passion and I had full support from my mom. I went to Cincinnati State Culinary School and graduated with an Associates in Pastry Arts & Certificate in Culinary Arts. It was a blast and then reality hit. My first job was at Busken Bakery and then The Bonbonerie. I couldn’t understand why they wouldn’t pay me more than $9/hour. “I can’t live on this!” I thought and agonized over what to do. I didn't want to work in a restaurant working nights and weekends. Plus, the pay would be just as bad. Then, my mind stepped out of the box as it usually does and I decided to start my own Personal Chef & Catering business. 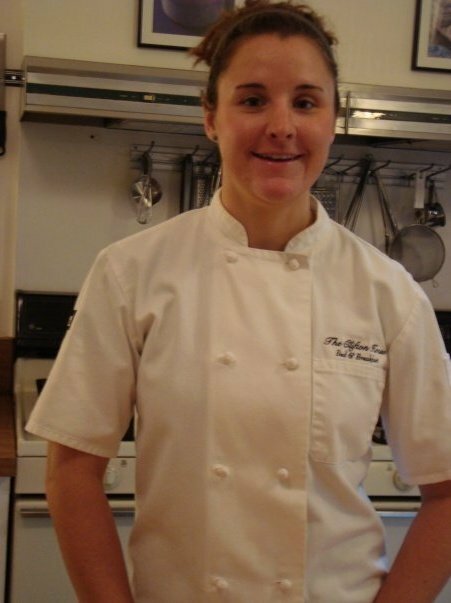 A job opened up at The Clifton House Bed & Breakfast, so I quit my job at The Bonbonerie though I would miss decorating the intricately designed cookies - seriously, I loved it - and started my Personal Chef business alongside working at the bed & breakfast. The bed & breakfast was great because it got me up and moving early each day and then I cooked for families after that. Plus, I got to cook whatever I wanted and experiment in the kitchen. Tea Poached Pears was one of my favorite things to serve! I cooked for families, Kappa Kappa Gamma Sorority, catered events and and life was great again! I had always been an entrepreneur so it felt natural to step into the shoes of a business owner. A few of my other ventures have been selling beaded articulately designed Dr. Scholl’s Sandals and selling homemade dried fruit at Findlay Market. While working at The Bonbonerie and decorating cookies all day I was inspired to put sprinkles or in this case beads on everything! I dried the fruit with my boyfriend at the time in my mom’s garage. She hated it! The smell literally permeated her garage and then into the house. I quickly realized neither of these ventures were lucrative enough and very time intensive. As I cooked for families around town I realized healthy food was my passion and so dove back into school at The University of Cincinnati with the goal of becoming a dietician. The school part was pretty boring and dry, but I struggled through. I worked at a few nursing homes and started my 200 hour yoga certification. I figured being a dietician and yoga teacher would give me an edge when applying for jobs. At the end of the dietician program it was time to apply for a internship. I applied at three different schools out of town. I waited and waited and agonized and waited. ...for about a week and then I got over it. I’ve believe things happen for a reason. My boyfriend - different boyfriend ;) - at the time I found out I didn’t get into the internship was supposed to go with me wherever I got in and we broke up shortly after that. So, thank God I didn’t get in!! He was working and I would not have been making any money so I would have been really broke!! I committed to trying once again to get into the dietetic internship in a year or so and continued to gain experience at nursing homes as a Chef and then a Dietetic Technician. While working as a Dietetic Technician under an actual Dietician I realized being a Dietician was not what I truly wanted. It felt dull and boring. I followed my impulses and continued the yoga teacher training and applied for a job at Tri Health as a Health Coach. Before I left my job as a Dietetic Technician I was finally offered the job at Tri Health. I was elated! I had applied for the job six months prior and finally got the call I was accepted. Life was great once again! I was teaching yoga, health coaching and doing cooking jobs here and there. Yoga felt like such a natural thing for me to do and teach, but as a career seemed like a distant dream. I kept teaching everywhere I could. I even drove 45 minutes twice a week at one point to teach yoga at the YMCA for $15/class! I knew deep down this was my career path and I had to keep going. I didn’t know how it would work out so that I could actually make a living salary, but chose to trust and have faith things would fall into place. I kept following the impulses that guided me along the way, introducing me to people and places that would help me make my dream a reality. But, my boyfriend at the time - different boyfriend again ;) - encouraged me to go for it. Thank you, him! I went for it and earned both my personal training certification and 500 hour yoga certification at the same time. I led my first yoga & hiking retreat after that and knew this was my path! This was my dream life. Ever since I have continued to follow my impulses allowing God to guide me along the way. This life truly can be a dream, my friends, if we just allow. Come with me, dear friends, on A Journey To Your Unlimited Self. 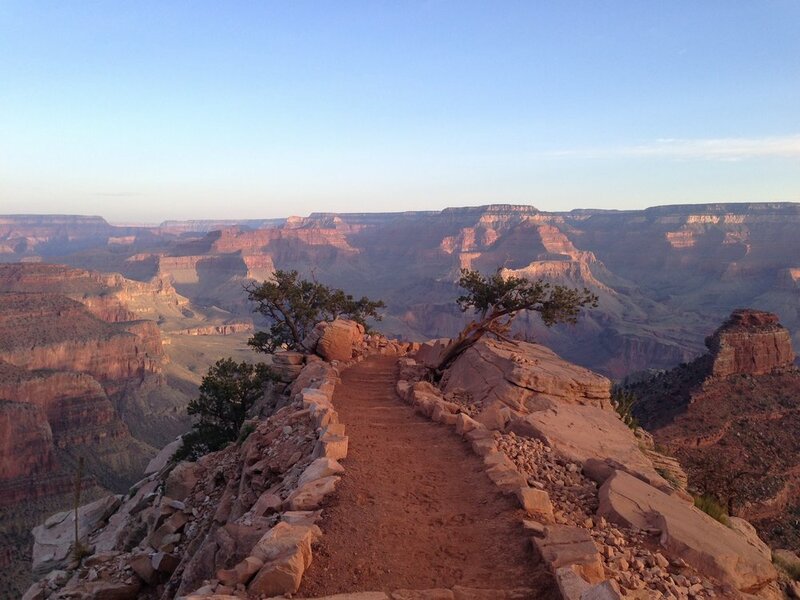 You will soar on eagles wings through the Grand Canyon and down to Phantom Ranch. After diving into the refreshing pools of waterfalls to cool off after a challenging hike you will reawaken your unlimited self. You will gain the confidence and knowing that you will be held and supported along the way in whatever leap you decide to take in your life. The limited self holds you back from your truest, most joyous and grandest self. I can’t wait for you to feel the breath of fresh air that will seep into your body - cells, muscles and bones - as you gaze at the depths of The Grand Canyon and feel the expansiveness that awaits in Sedona. I can’t wait for you to feel the strength & confidence that will stay with you once you return home. The unlimited self is waiting for you to step in. Do not let what you OUGHT TO DO or SHOULD DO stand in the way of what you WANT to do.